Last week, Chaos sorta ignored the latest sign that the citizens of the world's most frivolous nation have reached new heights of silliness, having been driven crazy by the overabundance of a peak energy environment: a new pill for obese dogs. However, when the phenomenon occurs twice in a fortnight, its time for action, or, at least a few words. 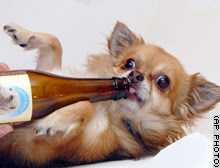 Here's the latest: beer for dogs. Chaos thinks that the two events are somewhat backward in time, but at least at present, your pet can sit back on the couch with you and enjoy a cold one, and later, take a pill along with you to mitigate the weight gain. As an example of "peak" everything, this is certainly a fine one, and one can only think things cannot really continue to reach higher levels of absurdity for much longer.